Christian Gather and Holger Barske developed the Minium (the name originates from aluminium, where the "alu" was omitted). It's a 2 way bass reflex speaker, where the Jordan JXR 6 HD full range driver is the central component. Due to the small size the Jordan JXR 6 HD is not capable of producing low bass at an adequate level, Therefore, two Visaton AL 130 take over below 500 Hz. ... "Rather oriented towards a warm sound, this speaker provided a pleasant and cosy atmosphere, without even a hint of metallic hardness. But still, the required precision was there, and there was no boredom coming up. Three-dimensionality is typically full range driver, extremely realistic and distinct, but with more width than depth. And besides, the Minium didn't shove the sound right under the listener's nose, but put it rather in between or behind the speakers. There was just a hint of coloration, well known songs sounded slightly "displaced". On the other hand, the bass scored by being enormously clean and tidy, without even a hint of insecurity. Peaks were produced spot-on and precise, but without any unpleasant edginess. Even at higher volumes the Minium kept her cool in all frequency ranges - no screaming, no whining, no helter-skelter. Mid and high frequencies were clean and well balanced, but could fall behind slightly with muffled recordings. Especially vocals were convincing due to their absolute natural reproduction as if there were no speakers at work. Acapella at a high volume caused lasting goose flesh. 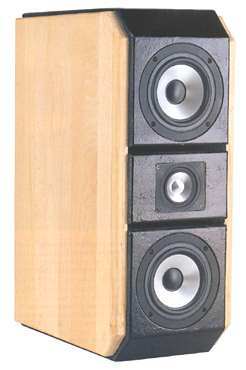 For those who prefer a pleasant sounding loudspeaker without compromising on precision the minimum is the ideal speaker, by combining the talents of hard diaphragms with the virtue of British tuning and the advantages of a small full range driver."